This was the second of U2's intense, "industrial" dance beat-influenced "electronic" albums. 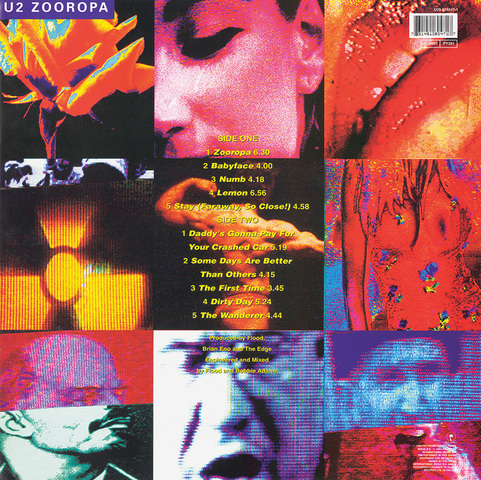 It continues very much in the same intransigent vein as its predecessor "Achtung Baby". Whereas that album contained several commercially attractive songs, this one was considerably more introspective. 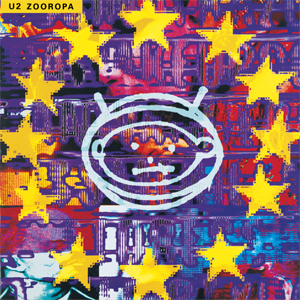 "Zooropa", the opening track begins in a laid-back, chilled-out ambient style, before it kicks in to a strong, bassy now instantly recognisable U2 thump. The music on here is supposedly "techno" in its influences I don't know much about that at all, but its dance rhythms and beats are matched by some solid rock guitar and muscular, powerful drumming. Basically, it is big, anthemic U2-style stadium-ready rock merged with dance beats on occasions and some electronica too. "Babyface" has a sumptuous bass line, great guitar lines and a slow, seductive but hooky chorus, together with some infectious isolated drum sounds in the middle. These are more than just dance style songs with minimalist chanted, repetitive lyrics. They are actually good songs. "Babyface" is a particularly impressive one. The bass is so boomingly loud on "Numb", however, that I always have to turn it down much lower than normal. I like bass a lot, but I feel some of the songs in this phase of their career were overwhelmed by bass vibrations. Bono's vocals on here are a series of mumbles, to be honest. The spacey-sounding "Lemon" has a similar pumping rhythm, but a more appealing high-pitched vocal with Bono sounding a bit like Prince or Mick Jagger when he puts on a high voice. It certainly is evocative, intoxicating stuff. I like my music loud, but I have to turn this down low to appreciate and pick up on any nuances it may have. Was this the phase where Bono pretended to be this sort of devilish type creature, a sort of alter-ego? I think it was - oh yes, "MacPhisto", he called himself. Contemporary popular disdain for Bono surely has its origins in that sort of guff. Despite Bono's pretensions and posturing, a song like "Stay (Faraway, So Close!)" is a totally captivating, beguiling song. "Daddy's Gonna Pay For Your Crashed Car" is a dance-ish beaty number similar to the sort of thing David Bowie would put on "Earthling" a few years later. For once, U2 got there first. "Some Days are Better Than Others" has a catchy bass line, again it vibrates too much, but the song has an energising, stimulating hook. "The First Time" is indeed the first time that anything on the album harks back to "The Joshua Tree" phase. It is a brooding love song against a low-key drummed electric guitar backing. It also has some Bruce Springsteen-style "yeeeh-heeeh" "I'm On Fire" wailing half way through. "Dirty Day" is an underrated, sometimes forgotten track on here with a convincing high vocal and some excellent buzzy, wah-wah-ish guitar. "The Wanderer", with Johnny Cash, is so ridiculously incongruous that I don't play it when I play this album. Overall, this is an adventurous, barrier-pushing piece of work but the production is too vibrating, bass-wise for me, and that's saying something because I usually love a booming bass sound. PS - the "new mixes" of several tracks appear on "The Best Of 1988-2000" and they are less floor-shaking bassy. "Numb" is one of them. The others are "Stay", The First Time", "Dirty Day" and "Lemon".